Get CPD points in your own time! You can get trained and certified in your own time. 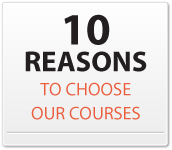 Our online training platform allows you to access our wide range of courses from the convenience of your browser. We have trained many different individual users, ranging from clinical staff to medical students. All of our courses are accredited by the Faculty of Pharmaceutical Medicine of the Royal Society of Physicians and our training is used by some of the largest pharmaceutical manufacturers, contract research organisations and medical institutions worldwide so you can be sure that your training will open doors.